Skerries is the overall winner of the National TidyTowns Competition 2016. Skerries also won the Best Large Town Award, the Regional Award, (this award goes to the best town in the nine counties of Louth, Meath, Dublin, Wicklow, Kildare, Laois, Offaly, Westmeath and Longford), County Award and a Gold Medal in the competition. Skerries was additionally awarded the National Value Water Award. It is a beautiful town to live, work and visit. Skerries Tidy Towns Committee continue to be inspired by the natural beauty of the town. The Skerries Tidy Towns Committee is strongly committed to the protection of the environment, enhancing and maintaining the town’s character and working towards a sustainable future for the town. We work to keep our town clean and well-presented while always being aware of its biodiversity and the sustainability of any projects we undertake. We believe the success of Skerries in the National Tidy Towns Competition has contributed to the great pride of place evident in the residents of Skerries. Apart from the huge pride everyone has in the town, winning brought a great understanding of how significant this win is. It gave meaning to all the hard work by so many people over so many years. 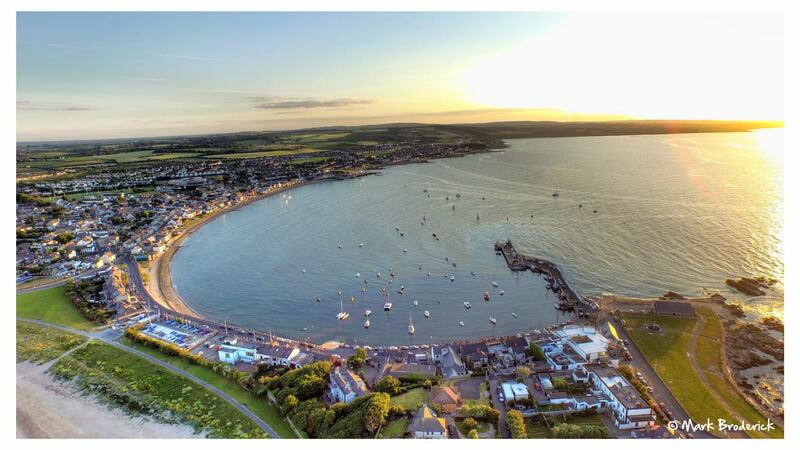 From a commercial point of view it has put Skerries on the tourist map, with a big influx of visitors to the town. The Skerries Tidy Town Committee meets fortnightly from September to April. From February to October there are organised work parties each Monday morning. Adopt a Beach has been a very positive initiative by Skerries News. Following on its success, Skerries Tidy Towns initiated an Adopt-a Patch scheme. We invited individuals or groups to volunteer to adopt an open space and keep it clean. We thank all the volunteers who help us in numerous ways, from picking litter to adopting flower containers or coming out to help with work parties. They were instrumental in our winning the National title of Irelands Tidiest Town 2016. Ensure all business premises are clean, with shining windows, good paintwork and well cared for floral displays. Window boxes, on business premises in Skerries, with irrigation systems, would further enhance the town and add welcome colour to the environment. Windows should be kept clear of advertisements and notices. We recommend the display boards used by our Estate Agents. Pick up that piece of litter and put it in the nearest bin. Keep your garden and grass verge well-trimmed. Organise a clean-up day in your estate. Join our work parties which are advertised on our Facebook page, in the fortnightly Skerries News and the Church Bulletin. Our regular work parties meet at the old fire station on Quay Street at 9.30am each Monday morning. Join one of our adoption schemes and look after an area in your own time. We appeal to people who bring items to the bring centres to refrain from leaving cardboard boxes, plastic bags, clothes and household objects dumped beside them. Bring banks are for bottles, cans and clothes. No household objects or duvets are accepted. 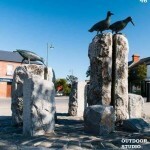 Follow the Tidy Towns Facebook Page. Contact us at Skerries Community Centre, Dublin Road, Skerries. 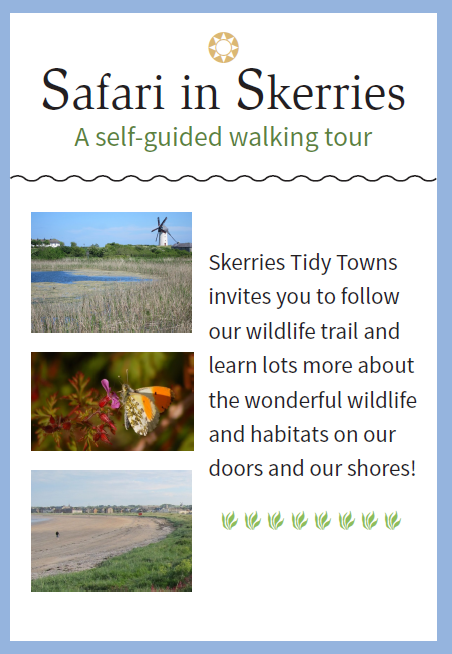 Send an email to tidytowns@skerriesca.com. 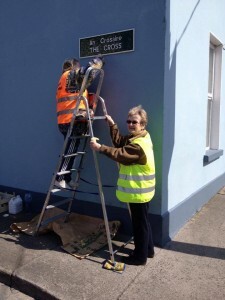 Check the SCA website News: Tidy Towns for news from the Skerries Tidy Towns committee! Although prize winning is the ultimate goal it is pride in your place that keeps everyone going and will certainly keep Skerries TidyTowns going. If we all work together we can achieve great accolades. We acknowledge the great contribution the residents and businesses of the town have made to the success of Skerries in the National Competition. 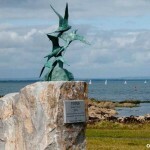 Skerries Tidy Towns have also published a number of self-guided walks. 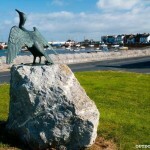 The latest is a wildlife trail through our town called Safari in Skerries. Two others which you can also see on the website here are the Slí na Sláinte, a 4km signposted walk around our town, and the Historical Walk. Click to open the full guide. Page last updated on 27 January 2017.